I read this article and found it very interesting, thought it might be something for you. The article is called India’s Defence PSU HAL Leans On Domestic Monopoly and is located at https://archive.indiaspend.com/sectors/indias-defence-psu-hal-leans-on-domestic-monopoly-18604. India has been spending approximately Rs 10,000 to Rs 11,000 crore every year in importing arms. But with debates on India’s defence preparedness heating up and a greater stress on domestic manufacture, IndiaSpend’s Sourjya Bhowmick looked at the competitive scenario for Indian defence companies to see how the manufacturing equations could evolve in coming years. First stop was Hindustan Aeronautics Limited (HAL) among India’s seven defence public sector unit (PSU) enterprises. The quick conclusion: India’s defence manufacturing capability is still largely dependent on domestic consumption with a smattering of exports. Defence was formally opened up to India’s private sector in May, 2011 with Foreign Direct Investment allowed upto 26%. Moreover, the Government announced its Defence Production Policy in January 2011. HAL is the largest defence PSU under the Department of Defence Production, Ministry of Defence. It was started in 1st October, 1964 and currently has over 19 production units and 10 Design and Research centres across 8 locations in India. Till now HAL claims to have manufactured 3,658 Helicopters/Aircrafts, 4,178 Engines, upgraded 272 aircraft and examined and repaired 9,643 aircraft 29,775 engines. HAL’s revenue for in 2010-2011 stood at Rs 13,116 crore and it 90% of its sales is to the Indian Defence Services. Interestingly, HAL also exports to Vietnam Air Force, Royal Thai Air Force, Nepal Army, Royal Air Force, Oman and Boeing, USA among others. Upto November, 2011 HAL’s exports stood at Rs 267 crore for 2010-2011. HAL’s profit was Rs 2,840 crore. HAL, though a Defence PSU, does not get any funding from the Union Government or any Ministries, rather is fully self-reliant. Here’s a 5-year balance sheet study. It is evident from the above table that domestic sales of HAL are steadily increasing but exports are erratic. On the other hand, sales and profits have been rising steadily. As has been manpower cost, which, like many Government organisations, has more than doubled in the last 5 years. HAL also has a very large workforce, currently at 33,681. Dhruv, Chetak, Cheetah and Cheetal (all helicopters). Here are other projects that HAL has worked on. Light Combat Helicopter (LCH), indigenously developed made its first flight March 29, 2010. Light Combat Aircraft (Tejas) obtained it’s clearance in Jan, 2011 and a series of production is in progress, expected to be fully operational by 2012. Advanced Light Helicopter (ALH) MK III developed for the Army and Air Force. It can operate at 6km altitude and installed with systems like electronic warfare sensors. Intermediate Jet trainer (IJT) successfully completed flight trials with AL-55i engine. First set of Limited Series Production aircrafts also successfully flight tested. Interestingly, AL-55i engine is not an indigenous product but received from Russia on December 28, 2008, two years later than committed. The naval version of Light Combat Aircraft (LCA) has been started in July, 2010. A Joint Venture between HAL and United Aircraft Corporation-Transport Aircraft (UAC-TA) Russia on Dec 1, 2010 to develop a multi role aircraft. All these were achieved/under progress in the year 2010. Now let us see what was done the next year, i.e. 2011. 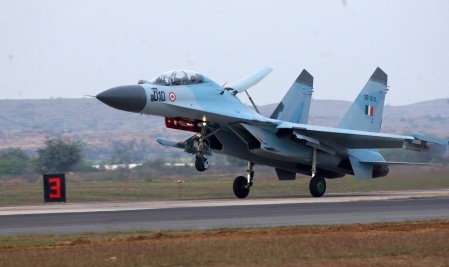 Su 30 MKI aircraft, which is manufactured under license in 4 phases, the licensing for that is completed. Raw material procurement has commenced. This is the only specific achievement we noticed in this year’s Annual Report. All other points mentioned are all seem to be repetitive of the previous year. However, the HAL Annual Report on the other hand illustratively jots down its achievements during 2010-2011. It says that it has produced 78 aircraft and helicopters, with engines and accessories. A big achievement has been the DHRUV, a multi role helicopter. It was incorporated in the defence services in 2002 and later exported to Nepal and Israel. However, it is not an indigenous product and produced with assistance from Messerschmitt-Bölkow-Blohm (MBB), a German aerospace company. Sukhoi 30 MKI can be termed another success of the HAL. Sukhoi, is one of the most superior fighter aircraft and expensive than many. India first signed a deal with Russia in 2000 and the first lot of Sukhoi’s was accepted into the Air Force in 2002. Quite sooner, in 2004, the first indigenous Sukhoi was built. Currently, Indian Air Force has 137 Sukhoi 30 MKI. HAL has also played an important role in India’s space programme. HAL has manufactured structures for Satellite Launch Vehicles like INSAT (Indian National Satellite), IRS( India Remote Satellite), PSLV ( Polar Satellite Launch Vehicle) and GSLV ( Geo-Synchronous Satellite Launch Vehicle).